The raw deal given to Gurgaon and South Haryana forced the sitting MP Rao Inderjit Singh to rebel from the Congress, a Party that he represented for 36 years. 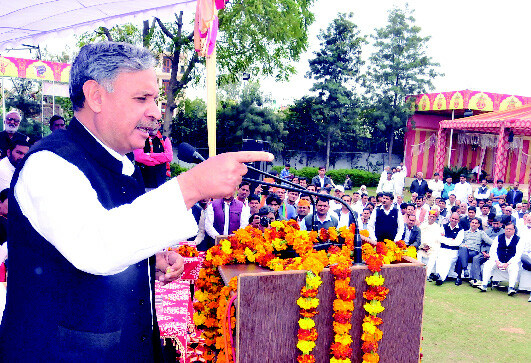 A senior leader from South Haryana, Rao Inderjit was also cornered by Haryana Chief Minister Bhupinder Singh Hooda, whose close proximity to the corridors of power in Delhi ensured that the Gurgaon MP remained on the margins of both the government and Party, in Haryana as well as the Centre. However, Rao Inderjit, like his father (former CM Rao Birender Singh), is not known to forget a political snub easily. Speaking to Friday Gurgaon, Rao Inderjit Singh says that he left the Congress after realising that the Party had become a private company and the Chief Minister represented only one district - Rohtak and one lobby - builders. “Gurgaon is today a civic nightmare,” he asserts. As the sitting Gurgaon MP, Rao Inderjit (the BJP candidate now) is in a strong position, thanks to his vote bank and the Modi ‘wave’. Friday Gurgaon asks him of his plans for Gurgaon and Gurgaonites. Why is your party or leader the best for the country, and Gurgaon? Narendra Modi today represents a strong leadership, which can give the country a stable government, tackle the challenges of development like he has done in Gujarat, and thus give a strong push to economic growth - which needs stability. More than anything else India today needs jobs and an impetus to the economy, which only a leader like Modi can ensure. The success of BJP now, and later in the State polls, will ensure that development, employment, growth and the building of infrastructure would be equal across the State. Jobs should be given on merit, and not because someone hails from the home district of the Chief Minister or is related to him. For the nation as well, a strong Prime Minister will ensure faster and bolder decision-making, which is sorely needed. What would you do for Gurgaon as a more empowered MP? How do you plan to resolve the various problems faced by the fast-expanding City? I know there are many problems in Gurgaon, but it was the intransigence of the Congress government and its failure to look beyond certain cities, which ensured that South Haryana remained in a pathetic state. Despite contributing more than 60 per cent of the State’s revenue, what do we get in return? As an MP who has a say in the government I would propose the setting up of a Gurgaon Development Authority (GDA), which would be an overarching body empowered to take decisions locally. We will not have to look towards Chandigarh for every small thing, and even major issues would be resolved here. This will ensure faster decision-making, better co-ordination among the agencies and a time-bound implementation of specific infrastructure projects. How do you plan to take on the builders’ lobby in Gurgaon? The control of builders is all-pervasive in the State, with no politician or government institution daring to take any action despite alleged large scale bungling? What has happened will not continue for long. All the licences that have been issued in the past will be scrutinised, and wherever there is any violation of rules and regulations, the authorities will impose penalties - and if need be the licences of habitual offenders will be cancelled. The Real Estate Regulator will be given enough teeth to ensure that no builder is able to give possession to buyers without a Completion Certificate. The agreements between builders and buyers would be balanced and there would be no exploitation. The Regulator would also need to ensure that developers follow the rules, build the infrastructure and then leave the premises once they are finished. What are the top three agendas in your Manifesto for Gurgaon? The top three agendas would be: setting up the Gurgaon Development Authority (GDA); giving more powers to the Gurgaon Police Commissioner, like the Delhi Model; and ensuring availability of adequate water and power for the City. Giving more power to the Police Commissioner will ensure that the City becomes safer, as decision-making would be quicker, the police would be less politicised and have their ears to the ground - rather than looking towards Chandigarh for leadership. It will also ensure better management and control of traffic in the City, and the introduction of more policewomen - which is required in a city like Gurgaon. For ensuring the availability of water we need to focus on natural canals, which were serving this area for centuries but have fallen victim to concretisation and urbanisation. We need to revive water bodies like Sultanpur, Damdama and Badkhal, so that the water table rises. Rain Water Harvesting in Gurgaon and the Aravallis is also the need of the hour. What do you think are the major issues and problems that need to be tackled? How do you plan to address these shortcomings? One of the top priorities would be to ensure that the Delhi Metro line through Dwarka is brought to ‘old’ Gurgaon via Palam Vihar and Atul Kataria Chowk. Another top priority is to ensure rail connectivity with Mewat, which will ensure that this area becomes more accessible and development reaches there easier. Gurgaon, and in fact the entire South Haryana, lacks an integrated transport system, which has made people dependent on autos, shared taxis and buses. I will ensure that we have a great intra-City bus service, and more stands and stops. At the Centre I will take up the issue of setting up an MRTS to connect Rewari with Delhi, and also to set up a monorail from Gurgaon to Manesar. How are you going to tackle corruption in high places, and the daily corruption that hits the common man the most? I have a clean track record, and despite 36 years in politics no one can accuse me of corruption - which has tainted the entire political spectrum. In my view there is need to strengthen the State Vigilance Organization and bring honest officers forward. We need to send a clear message that action will be taken against the corrupt. Political Parties and leaders also need to set personal examples. The land scams that have taken place in the last ten years also would be probed, and those who have benefitted by subverting the rule of law would be made accountable. Land deals, ad hoc CLU changes and employment scams will also be probed. We do not want to be vindictive, but we need to ensure that the corrupt are made to pay for their unlawful deeds. Gurgaon is both urban and rural. How do you plan to integrate the two for equal development? It is a dichotomy that Gurgaon has some of the richest urban areas as well as a hinterland that is not developed and lacks any support from the government. The original inhabitants are out of the State govt’s sight and mind. We need to take governance to the peripheries of this Constituency, and ensure that the huge resources in terms of land and manpower are utilised effectively. I plan to give a massive push to agriculture as well as start technical colleges in rural areas - to train the youth and enable them to get jobs. There is also a need to impart soft skills training to the local workforce. While there is a shortage of trained manpower in urban areas, industry does not give jobs to the rural folk, as they are not ‘polished’. I will also try to get more industrial hubs created in backward areas of South Haryana, to ensure that there is an even spread and Gurgaon, which is a commercial hub, does not get choked by population and pollution. What are your plans to safeguard the greenery and environment of Gurgaon City and the adjoining areas? The Haryana government’s push for construction in the Aravallis needs to be stopped, as it is a decision bad in intent and would cause unimagined disaster to the environment. These hills have saved Haryana and Delhi from desertification, and in our greed for more land we should not forget that these are the very basis of our existence. First, this decision needs scrutiny, and thereafter efforts would be made to revive old lakes, ponds and channels in the area. I will push for setting up more Seawage Treatment Plants and wastewater recycling. All these efforts will go a long way in saving the environment. We will also work closely with the NCR Planning Board to ensure that our development is in synergy. Why should the youth and women vote for you? BJP today has the largest number of youth and women volunteers, which proves the popularity of the Party among these sections. The youth in Gurgaon want jobs, a stable government and a strong leader. For these reasons they are going to vote for us. For women, the Party will ensure that the City, the State of Haryana, and India as a whole, is a lot safer and more secure – on the streets and at work. What makes you a proud Gurgaonite? The large-heartedness of the people of this Region, who have embraced change, and the people from outside who treat this City as their own, is the great virtue of Gurgaon. I am also proud of the large number of migrants who have come here and ensured that this City has become a symbol of India's successful urbanisation. I am proud of the assimilating culture of this Region, where people believe in the dictum of ‘live and let live’.